Against a background of high current and foreseeable food import prices, agriculture shows an unsatisfactory performance, with lower production of provision crops, vegetables, beans, citrus fruits, corn and other products. This sector is marked by subjective management deficiencies [and] a decline in labor productivity and also in the average hours worked. While not forgetting the weather effects suffered by agriculture in previous years and the impact on it of the Special Period, this sector must produce an important part of the food we now import at high prices, has to eliminate the negative factors in its management and raise its productivity, the only effective formula to reduce the prices of agricultural products and so make a substantial positive contribution to public opinion and the country’s balance of payments. —Report of the Commission for Economic Affairs to the National Assembly, 22 December 2006 (Granma, 25 December 2006). With the end of the cold war and the loss of Soviet bloc supports for the Cuban economy receding into history, the issue of the sustainability of Cuba’s agriculture in its present state has moved center stage. More favorable weather conditions have exposed the secular flaws in the agricultural sector that for a while were mixed up with the effects of hurricanes and a particularly severe drought. Can the government continue to muddle through, or has that option run out of road? Can a radical overhaul be avoided for much longer? As the most striking and most easily documented, the fatal consequences of misguided policies for Cuba’s sugarcane agroindustry have so far attracted the greatest attention and were discussed at some length at last year’s ASCE conference (Hagelberg and Alvarez, 2006). The sugarcane agroindustry exemplifies the impact of the institutional framework and the importance of access to the necessary inputs as determinants of performance. Although not exclusively, this paper will focus on non-sugar food production and, particularly, its commercialization. Both sugar and non-sugar agriculture have been hamstrung by an unserviceable model of top-down control and micromanagement. Specifically in the non-sugar area, creative policy-making and performance have been handicapped additionally by a visionary egalitarianism and the fear that relaxation of the public distribution system would open a wedge for the emergence of a private economic—and, ultimately, political—sphere beyond the control of the state. But in seeking to prevent the development of competing centers of power, the regime has also discouraged productive entrepreneurship. Attempts to drive private intermediaries out of business, of populist appeal, have served to conceal rather than cure genuine structural inefficiencies. Ironically, far from straightening the path from producer to consumer, the state’s engagement in every nook and cranny of the marketing of farm products has interposed a bureaucratic maze of Byzantine complexity and corresponding cost. Beyond the subsistence level, agricultural producers do not operate in isolation and how they perform largely depends on their ability to access the necessary inputs and on the efficient commercialization of their products. To design successful policies for the sector, agriculture has to be seen and understood in its totality as a system, and proposals for reform must take a systems approach. The different components of the sector do not operate independently of each other. They interact, and how they interact is moreover affected by the institutional setting in which the system is embedded. So the problems that arise as the result of such interaction are complex and do not have simple solutions. A change in one part may have unavoidable and unintended consequences in another part, and improvement in one area can actually make everything else worse. Rather like the ropes and pegs with which the Lilliputians tied down Gulliver in Jonathan Swift’s satirical tale, the government has subjected food production and marketing to a multitude of constraints. To unravel them will take time and patience. The most important among the many fetters need to be identified and cut, if reforms are to produce palpable material results and have a positive political impact. There is no quick fix. A brief look at three aspects—production, labor productivity and foreign trade—will give an idea of the critical condition of Cuba’s agriculture, particularly of the state farms and the Basic Units of Cooperative Production (UBPCs) established in 1993 with workers from state farms, which together occupied 73% of the country’s agricultural area and 64% of its cultivated area at the end of 2006 (ONE, 2007, Table X.1). Overall, Cuba’s agricultural sector has, at best, stagnated in the last six years, reflecting not only the effects of adverse weather conditions, but also lack of essential production inputs and inefficient employment of existing resources. According to official figures, the total contribution of agriculture (including forestry and fishing) to the gross domestic product in the period of 2001 to 2004 fluctuated narrowly between 1875.7 million pesos (2002) and 1924.6 million pesos (2004), at constant 1997 market prices, before falling to 1700.5 million pesos in the drought year 2005 and further to 1597.7 million pesos in 2006. In current market prices, the Gross Domestic Product (GDP) attributable to agriculture ranged between 1997.2 and 2091.4 million pesos in 2001 to 2004, but declined to 1860.8 million pesos in 2005 and 1795.9 million pesos in 2006 (ONE, 2007, Table IV.2). Agriculture thus dropped by 6.0% in constant prices and by 3.5% in current prices from 2005 to 2006, despite abundant rain and the absence of hurricanes. It was the only macroeconomic sector to register a decline. Physical output figures for the various lines of agricultural products paint a mixed picture. Summarizing the data for the period 2000 to 2005, Nova González (2006, pp. 307–308) found a declining trend in potatoes, notwithstanding the priority in the supply of inputs given to the crop, but a rising trend in other roots and tubers; vegetables showed a sustained increase, except in 2005; rice was marked by instability; bean production had tended to increase, again except in 2005; and citrus fruits had been substantially affected by hurricanes. Similarly, in the livestock sector, bovine cattle production had seriously deteriorated, while pig, sheep and goat production had grown, as had egg laying, although both pigmeat and eggs had not yet reached pre-Special Period levels. Official figures for 2006 show reduced outputs of roots and tubers, vegetables, corn, beans, citrics and other fruits, compared with the year before, against higher volumes of bananas, rice and tobacco, but in all lines, with the exception of vegetables, at lower levels than in 2001 (ONE, 2007, Table X.7). Pork and egg production maintained a rising trend in 2006, milk production improved over 2005, but was still far less than in 2001, and beef production continued in decline (ONE, 2007, Tables X.18, X.19, X.21, X.23). The latest FAO food production indices to be found for Cuba (Food and Agriculture Organization, 2006) stood at 113 and 111, total and per capita respectively, in 2004, against 118 and 124 in 1989–1991 (1999–2001 = 100). In light of the unsatisfactory results for 2005 and 2006, it would appear that, on the whole, Cuban food production has not yet recovered the level reached before the onset of the Special Period that followed the end of Soviet bloc supports. The reported increases in the physical output of a variety of food crops, and initiatives such as the creation of urban market gardens, have not offset the overall decline in animal products and the deactivation of sugarcane lands. Citing reports of the Economist Intelligence Unit and of the U.S. Department of Agriculture, a recent study of the United States International Trade Commission (2007, p. 2–10) concluded that Cuba’s current agricultural output was about 55% of the level in 1990 and the non-sugarcane sector had not yet returned to the level of production in 1989. Turning to what is supposedly the core business of MINAZ, the 2007 sugarcane harvest has been another debacle. In the absence of an official figure, production is estimated at 1.1–1.2 million metric tons of sugar, raw value, marginally down from the previous crop, reported to have yielded 1.2 million tons (ONE, 2007, Table IX.3).4 The final result is a far cry from the 32% increase, underpinned by a 28% growth in the volume of available cane, forecast by a spokesman of the ministry at the beginning of the season (Granma, 28 December 2006, 7 January 2007). Instead of drought, heavy rains and high temperatures are blamed this time. Without denying the effect of the weather, the truth is that the industry is now so enfeebled and bereft of reserves that any adversity throws it widely off course. Even added together, the last three crops barely exceed the 3.8 million metric tons of sugar produced annually on average in the decade up to the 2002 restructuring. As Table 1 shows, a return to the 2004 area and yield would be required, in the first instance, to make an output level of just 2.5 million metric tons of sugar a bankable prospect. At 397,100 hectares, the total harvested cane area in 2006 constituted only 27% of the 1,452,200 hectares reaped in 1990/91, at the outset of the Special Period (ONE, 2007, Table X.5). The overall cane yield in that crop was 54.9 metric tons per hectare (53.2 tons in the state sector, 63.7 tons in the non-state sector), almost double the average national yield of 28.0 tons reported for 2006. Throughout the years, CPA and CCS growers have performed notably better than state farms and regimented UBPCs. Employment in the agricultural sector has fallen from nearly 976,000 persons—about 22% of the total national workforce—in 2001 to 952,000 persons—20% of the total—in 2006 (ONE, 2007, Table VI.3). Without entering into a debate on the unorthodox manner of measuring Cuba’s gross domestic product adopted by the authorities, which inflates the contribution of community, social and personal services, and therefore total GDP, by comparison with the standard international method, it is a mark of the low labor productivity in the sector that this 20% of the national workforce contributed just 3.2% of total GDP at current prices (3.6% at constant 1997 prices) in 2006. Correcting for the omission from GDP statistics of the value of farm production for self-consumption could not erase a significant asymmetry. On dividing the absolute contribution of agriculture to GDP in this period among the number of persons employed in the sector, per capita productivity is found to have fallen from roughly 2072 pesos in 2001 to 1887 pesos in 2006. The latter figure works out at barely more than 157 pesos per month. This compares with an average monthly wage of 387 pesos in state-owned and mixed entities in the agricultural sector in 2006 (ONE, 2007, Table VI.4). The data suggest a widening gap between pay and productivity in the sector. If agricultural workers earned far more than the value of their output, the difference must have been made up by government subsidies. 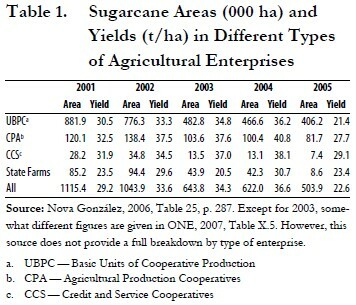 But of the large subsidies shown in the budget (ONE, 2007, Table V.4), a substantial portion of which undoubtedly was related to agriculture, only 135 million pesos are clearly identified as having gone to sugarcane growers in 2006, although that figure looks rather more impressive when put against the size of the crop. Data on cash incomes (ONE, 2007, Table V.l) point to sharp differences in performance between different types of agricultural enterprises. At 1781.8 million pesos and 300.6 million pesos in 2006, the recorded incomes of independent farmers and of cooperativists stood 42% and 32% higher than their respective 2001 levels. In contrast, the 2006 income of UBPCs—cooperatives more in name than in fact—totalling 688 million pesos, did not quite reach the 2001 figure. 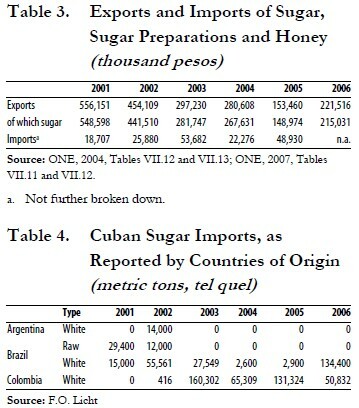 Whereas Cuba’s food imports show a rising tendency, its food exports have fallen precipitously owing to the reduced availabilities of sugar in the wake of the 2002 restructuring of the sugar industry.5 In consequence, official Cuban statistics show a growing adverse balance in the country’s international food products trade (Table 2). Imports of food products and live animals have become a significant burden on Cuba’s balance of payments, accounting for 13.4% of its total merchandise imports in 2006, with the deficit in the food trade balance of 937.0 million pesos constituting 14.1% of the total merchandise trade deficit of 6660.8 million pesos that year (calculated from ONE, 2007, Tables VII.9 and VII.10).6 This stands in striking contrast with the positive food trade balance enjoyed by Cuba until 1998 (ONE, 2004, Tables VII.10 and VII.11). Needless to say, in light of the extent of the decrease in sugar availabilities and the insufficient development of other lines, the decline in sugar exports has not been offset by increased exports of other farm products (ONE, 2007, Table VII.7). Most of the decline in food exports is attributable to the drop in raw sugar exports following the 2002 industry restructuring, their net foreign exchange contribution being further diminished by the cost of mainly white sugar imports (Table 3). Raw and white sugar shipments to Cuba from the three known suppliers—Argentina, Brazil and Colombia—add up to more than 700,000 metric tons in the six years from 2001 to 2006 (Table 4). Aside from a somewhat greater frankness in the public discussion of shortcomings, there is so far scant evidence that the government is prepared to question the premises underlying the management of Cuba’s agriculture. With total disregard of experience, the language employed in official fora reveals an unchanged top-down, central-command culture, at least in the sugar ministry. Such an attitude might claim some legitimacy so long as the central organs of government have the means effectively to assist the actual producers in the processes of production and marketing. Unable to do that, Cuba’s two ministries of agriculture are but two eunuchs dreaming of procreation. They are able to abuse their position in their relations with the producers, however, because of insufficient competition—the state doing its utmost until now to thwart the development of a vigorous private sector of the economy. Chronic non-fulfillment by government agencies of their contractual obligations renders agreements between the state and producers a one-sided bargain. Farmers are pressed to meet their “duties to society” (Article 3, Decree No. 191 concerning agricultural markets, 19 September 1994); state monopolies are free to ignore them. A case in point, brought to light by the president of the National Association of Small Farmers (ANAP), Orlando Lugo Fonte, was the failure of the state trust of pork enterprises to supply the livestock feed that formed part of its deal with the cooperative and unaffiliated farm sector to provide more than 60% of the pigmeat planned by the trust for 2007 (Granma, 20 February 2007).8 While the state agency’s feed debt had been reduced, it still owed 4000 metric tons, and the feed it did deliver was not always of the required quality. As far as the trust’s head was concerned, higher prices of grain imports constituted sufficient excuse for the shortfalls. But it is in its failure adequately to perform the most basic functions of procurement— collecting the farm products, where the buyer is responsible for haulage, and promptly paying for the goods received—that the system’s deficiencies and the negative consequences of the absence of sufficient competition are most obvious. A series of articles in Granma in February-March 2006 on farm product marketing gave expression to what undoubtedly was widespread dissatisfaction among consumers as well as producers with the way the system was operating. At the heart of the system lies the Unión Nacional de Acopio, a dependency of the agriculture ministry and the principal arm of the government linking farmers with domestic consumers. According to its head, Acopio had 17,000 employees in early 2006, 40% of them in administrative and bureaucratic jobs. Acopio’s buyers, i.e., its interface with the farmers or their representatives, numbered 1900.9 At the other end of the distribution chain, Acopio was running a large food retail business, servicing 533 state agricultural markets and 1575 sales points, as well as kindergartens, schools and hospitals (Pagés and Castaño, 2006b10). In explanation of the delays in crop collection, one of the main farmer complaints because of the perishable nature of much of the produce, the head of Acopio, in an interview with Granma journalists, described the dilapidated condition of its vehicle park. Of the 1200 trucks at the disposal of the organization—the youngest 20 years old—only 60% were in service, the rest being laid up for various reasons, such as want of tires or batteries (Pagés and Castaño, 2006b). Coupled with repeated reminders of the Special Period, the boss of Acopio evidently considered this sufficient justification for his agency’s defaults in the matter of crop haulage. Less easily explained away was the existence of a related bone of contention—a lack of scales to weigh the produce on collection.11 Scales to weigh, say, bags of onions are, after all, not complicated mechanisms, subject to rapid wear. Nevertheless, according to the head of Acopio, the agency was all together short of not less than 6000 scales. The matter is not just one of now, when transport equipment is scarce. When there were enough trucks, crop losses were reported several times, which shows that the matter is not only lack of collection infrastructure, but failings in other mechanisms of coordination. The root of crop losses is to be sought in the production contracts between producers and collection agencies, which lack the objectivity and efficiency necessary for these contractual relations to run positively. The other major source of farmer dissatisfaction —late payment (beyond 30 days) —had to be seen in the context of Acopio’s fraught financial situation, according to the message of its director to Granma readers. Insufficiently capitalized, Acopio carried accumulated losses of 58 million pesos at the end of 2004, of which 30 million pesos were covered by a subsidy from the ministry of finance and prices in 2005, leaving a deficit of 28 million pesos on that account at the beginning of 2006. In 2005, Acopio lost 53 million pesos, of which 40 million pesos were attributable to the special prices at which the organization sells to educational and public health establishments, lower than those it pays to the farmers (Pagés and Castaño, 2006b). The obvious question why social consumption was being subsidized in this roundabout way, burdening farmers and food marketers, was not addressed, aside from an assurance that the ministry of finance and prices was looking at an alternative. Illustrative of the sluggish responsiveness of the governmental apparatus is the fact that the issue of late payments to agricultural producers was still on the table more than a year later, to be resolved “shortly” (Lee, 2007a12). It was finally declared to have been laid to rest by minister of finance and prices Georgina Barreiro at the June 2007 sitting of the National Assembly, but only at the cost of adding to the bureaucratic baggage: renegotiation of bank debts and government financing of losses from prior years; establishment of national working parties in the agriculture and sugar ministries to monitor the state of indebtedness and maintain a weekly register of arrears; a new procedure of presenting certified invoices to the banks upon which these will make payment for deliveries; creation of a rotating fund to liquidate enterprise debts; and orders to the heads of provincial governments to establish a system of control at provincial and municipal level (Pagés, 2007c). While the inspiration and objectives of the Granma articles are open to speculation, they had the clear earmarks of a campaign, and there was a novel, attention-grabbing sound to the tone in which the topic was discussed. However, equally clear—though perhaps not to people conditioned by decades of constant brainwashing—was their limited focus on the outward manifestations of the system’s malfunctioning. Not explored were the possible roots of the indisciplinas, to use the favored euphemism, in the concentration in state hands of decision-making in the sphere of agricultural production and marketing, in the impracticality of centralized micromanagement in these areas, in the irrational allocation of resources, and in the inappropriateness of administratively fixed prices for such fruits and vegetables as guavas and Swiss chard, neither of long shelf-life nor items of prime necessity. All the voices heard in the articles agreed on the need to increase agricultural production. However, the paradox of simultaneously calling, explicitly or implicitly, for more regulation —which, as experience showed, not only spawned more irregularities, but more often than not ultimately had the effect of restraining production — seems not to have been perceived.13 The regime had opened the floor to talk about the all too obvious symptoms, not about the disease. In one market, the manager complained that for nearly 10 months he and his staff had not been paid a 5% bonus on a turnover of about 2000 pesos daily, to which they believed themselves entitled. Yet turnover depended on what the market had to sell; it jumped when there were rice and beans or when independent producers from credit and service cooperatives came with good-quality fruit. To be qualified as “regular” on official inspection, the market needed to offer at least 17 different products, but that day had only 14. Sweet potatoes were the sole tuber for sale and by 10am just a single sack was left, the manager having allowed one customer to buy a whole bagful—a “violation” in Granma’s eyes, though the manager pointed out that there was no rule against it. Also found worthy of note was the fact that the manager did not have an office, a cyclone having taken off the roof, and was walking about with the market’s receipts on his person. On the other hand, he won Brownie points by cutting the price of produce about to spoil. The manager of another market told Granma’s reporters that he was not authorized to lower prices on produce losing quality and had no telephone to call his superiors to send a “specialist” to evaluate what could be reduced. In any event, such experts often came late, when the produce was no longer fit for human consumption. On this occasion, onions showing their age were still being offered at the ceiling price of six pesos a bunch. This establishment did not have a problem with the 5% bonus, but the assistant was wondering about the whereabouts of his base pay, having received only the sales incentive for close to a year. Here, the boxes of older produce were stacked on top of the most recently received and sold in order; but that meant that only mature fruit for immediate consumption was displayed and customers could not buy ahead to save themselves lining up every day. At a third market there was a long line of mostly pensioners waiting in the hot sun, the price list out of sight and barely readable, and only one person to serve the customers. Although the manager acknowledged that he was authorized to cut prices on produce of reduced quality, “nearly rotten” guavas and “very bad” Swiss chard were priced as first grade. A customer told Granma’s reporters about a well-supplied outlet with lower prices, run by the Youth Work Army, but too far for her in another part of town. On a follow-up visit to the small farm of a cooperative member selling his produce at the market, the Granma team heard of huge differences in the margins between the controlled prices and production costs of different items, even though the authorities were supposed to take the costs into account in setting prices. In order to be eligible for the bonus on sales, state agricultural markets had to stay below a certain level of product losses, a condition they could fulfill by selling deteriorated produce at a lower price. But that might diminish their turnover, which was another target to be met to qualify for the bonus. So overripe tomatoes were displayed at the top-grade price and the goodquality merchandise was hidden. Another trick was to package the produce and not weigh it, whereby a pound might cost three or four times the controlled price. There were no norms to determine quality, either on purchase from the producers or on sale to the consumers. Higher officials tended to blame lower ranks. According to the director of one Acopio enterprise, a poor assortment of merchandise in the markets was the fault of managers who rejected produce offered to them by his company and failed to buy from credit and service cooperatives and nearby market gardens, in spite of having at their disposal a fund of 3000 pesos to cover supply deficiencies. The key by which subordinate retail establishments were graded, this man said, was the number 4447 (four types of roots and tubers, four fruits, four cereals and pulses, and seven vegetables). Another Acopio director declared that market managers had not only the power but the duty to cut prices on produce of declining quality, and payment of the 5% bonus on sales was subject to fulfillment of more than five parameters, including the scarcely quantifiable criterion of “good treatment” of customers. Confusion, wide gaps between theory and practice, and even contradictory statements by senior functionaries should come as no surprise in an administrative construct of mind-boggling complexity, designed to substitute for a free market that, at least in its price-forming mechanism, is basically self-regulating in normal times. According to authoritative accounts, the modus operandi in 2006, in theory, was that the local authorities set prices for farm products month by month, subject to approval by the provincial governments to ensure uniformity, after analysis of availabilities and production and marketing costs by representatives of the various interested parties. Farmers selling through Acopio were deducted 29% from the ceiling prices to cover marketing, and prices for produce of less than top quality suffered discounts of 20% or 40% (Pagés, 2006a; Pagés and Castaño, 2006b). Since the 1960s, Acopio and Cuba’s agricultural markets, in general, have been reorganized time and again in vain attempts to cure their defects (Alvarez, 2004, pp. 162–167). Reports of collection and payment flaws and other production disincentives, waste for one reason or another along the entire chain from farm to retail outlet, rigid and unrealistic pricing, poor quality, and insufficient resources recur with monotonous regularity. Possible reforms being confined, in the first place, within narrow bounds by the ideological proclivities and political objectives of the regime, decision-making has also been molded by wishful thinking that tinkering with the organization and the rules could make things better. Outside of the informal economy, Cubans have not in all this time seen a great deal of the operation of market forces in food production and distribution. Basically, their experience has been limited to the free farmers markets that existed from 1980 to 1986 and to the supply and demand agricultural markets authorized since 1994 (Deere and Meurs, 1992; Espinosa, 1995; Marshall, 1998; Rosenberg, 1992). In neither instance has the state allowed a level playing field. Who could sell on these markets, what could be sold, and, in effect, how much could be sold (state quotas having to be filled first) has always been predetermined. No additional inputs have been provided to increase production for these markets. Private middlemen continued to be demonized even after their crucial role—functionally no different from that of Acopio—was reluctantly recognized. Consumer access to the markets has been limited by virtue of their relatively small number throughout the country, and public attendance has been restrained by the scant affordability of the goods on offer for the less well-to-do. Market imperfections—exorbitant prices for highly valued products not on the ration card or obtainable at controlled price, such as garlic; anecdotes of spectacular earnings of intermediaries possessing scarce means of transport and of growers close to large cities, especially Havana; cases of bribery and corruption—have occasionally generated popular discontent, particularly in the earlier period, and have been exploited by opponents of reform concerned over any threat to the attainment of the state’s policy objectives and shrinkage of its sphere of influence. Discussions about the reshaping of the Cuban economy have so far tended to hone in on the issue of property rights. Unquestionably, this is highly important. But in respect of agriculture and food marketing, it is, arguably, not the most urgent. With UBPCs officially classified as non-state, 65% of the island’s agricultural land is now notionally in the non-state sector (ONE, 2007, Table X.1). As the old adage has it, possession is nine-tenths of the law. That being so, the first thing is to rid the system of the disincentives and red tape that prevent it from functioning effectively. The complementariness of production, productivity and distribution in most lines of food agriculture is beyond dispute. From this it follows that nothing on the distribution side should prejudice production and productivity. If, for instance, producers believe their time more usefully spent on their farms than carrying their crops to the market, as has often been said, then the system has to allow for middlemen, and these have to be able to equip themselves to do their job. To justify its continued existence, the distribution model now installed in Cuba—organized by the state and relying in the main on government controls to ensure a life-sustaining minimum of food for all members of society, regardless of individual income—must be shown to be capable of matching the efficiency of a model regulated primarily by market forces. In other words, in addition to fulfilling the physical objective of putting enough food within reach of the consumers, the cost in subsidies and administrative expenses incurred in maintaining food prices at an artificial level across the board for all, irrespective of their ability to pay, ought not be greater than the cost that would be incurred by targeted supports for people really in need. Rigorous examination of the model through the lens of these criteria would indicate where the scalpel of deregulation should first be applied. Separating as far as possible the trading and transportation functions of Acopio and other state agencies, and decoupling long- from shortdistance haulage, in order to pave the way for the privatization of readily assimilable segments. Progressively reducing mandatory delivery quotas to state agencies and freeing producers, individually or in association, to sell surpluses to all comers, with the options of doing the harvesting themselves and selling ex-field, allowing the buyers to harvest and market, or themselves engaging in wholesale and retail marketing. As an initial measure to liberalize the access to inputs, facilitating the purchase or rental by private individuals, private firms and cooperatives of suitable vehicles as well as all other means needed for the business of trading in farm produce, including the employment of the necessary personnel. In the longer term, reforms of this nature will be inevitable. Whether they come sooner remains to be seen. Another dismal sugar crop in 2007 has not so far jolted the authorities into action. Continuing support of the Cuban economy by China and Venezuela may encourage further procrastination along the lines of the Augustinian prayer, “Give me chastity and continence, but not yet.” It would be prudent to remember, however, that the Chinese have a long historical memory and are among the inventors of the counting device to assist billing known as the abacus. 1. For an early critique of the restructuring, see Hagelberg (2002). Official references to 2 million hectares of sugarcane area were misleading and really meant the area under MINAZ oversight, the land actually planted with sugarcane at that point probably extending to less than 1.4 million hectares. In the course of the Special Period, the sugarcane area harvested shrank from an average of 1.44 million hectares in 1989/90–1991/92 to 1.04 million hectares in 2001/02, the last crop before the restructuring (ONE, 2007, Table X.5). Long overdue, the rationalization of the industry, when it finally came, took a form that doomed it to failure. 2. Curiously, the agriculture ministry itself has been without a cabinet-rank minister since September 2005 and in the care of a deputy. With harvests of a million hectares and more of sugarcane—the bulk of which in the state and quasi-state sector—there could have been some justification for the administrative division of the UBPCs, on their establishment, into cane and non-cane, responsible to the sugar and the agriculture ministry respectively. With a harvested cane area of half that size or less, after the industry restructuring, maintaining that separation becomes questionable. It may, indeed, be counterproductive if it discourages nominally non-cane units from growing cane, say, as a rotation crop. 3. The existence of a large amount of idle land formerly under sugarcane provides a context within which to assess the government’s programs, initiated in the Special Period, of urban market gardens and encouraging the cultivation of vacant plots elsewhere. These measures have undoubtedly been beneficial in improving the supply of fresh vegetables and herbs, saving transport and storage, providing gainful work for unemployed and retired persons, and making shopping easier for urban consumers. They are a lesson of what could be achieved by allowing people to do their own thing. But it would be to confuse important with sufficient to believe that such programs can play more than a relatively minor role in the revitalization of Cuba’s failed agriculture. 4. As far as is known, the Cuban public has so far been kept in the dark about the sugar produced in 2007. In the meagre account—appended to a report on transport—of sugar minister Ulises Rosales del Toro’s appearance at the June sitting of the National Assembly, the sole nationwide figure given was that of the average sugarcane yield: 34.0 metric tons per hectare (Pérez Navarro and Varela Pérez, 2007). This is within the range of average national sugarcane yields in the Special Period years prior to the 2002 restructuring and suggests that the statistically significant improvement to be expected from the elimination of the poorest-yielding plantations has not occurred. Numerate parliamentarians will have realized that if there was a substantial number of enterprises with yields far above the average, as the minister evidently was at pains to point out, it was offset by the continued existence of many with yields far below (cf. Varela Pérez, 2007b). 5. World market prices for raw sugar followed a declining trajectory from 1995 to mid-2002. Ironically, from a low of 5.75 US cents/lb in June 2002—when the restructuring of the Cuban industry was promulgated, the monthly average of the International Sugar Agreement Daily Price reversed direction and rose, with some setbacks, to a peak of 17.95 US cents/lb in February 2006, its highest level since 1981, before settling back to an average of 10.08 US cents/lb in the first half of 2007 (F.O. Licht). Interestingly, Cuba’s sugar exports of 3,068,855 metric tons in 2002 earned 441,510,000 pesos (ONE, 2004, Table VII.12), which works out at 143.87 pesos a metric ton or some 6.5 centavos a pound, still comfortably above that year’s reported foreign currency direct expenses of 5.2 centavos per pound for raw sugar (Hagelberg and Alvarez, 2005, p. 464). Thus, however high Cuba’s sugar production costs, they could not be said to have constituted a drain on the country’s scarce foreign exchange. Table 2. Exports and Imports of Food Products and Live Animals by Standard International Trade Classification (million pesos) 2001 2002 2003 2004 2005 2006 Exports 711.1 594.6 439.7 459.7 273.1 322.5 Imports 755.6 737.8 855.1 1033.5 1315.0 1259.5 Source: ONE, 2007, Tables VII.9 and VII.10. 6. Cereals, meats and dairy products (primarily milk powder) accounted for the greater part of food imports (ONE, 2007, Table VII.12). While wheat cannot be grown commercially in Cuba, a less dysfunctional domestic farm sector could no doubt supply more of the other products now imported. To stimulate milk and meat production, the finance and prices ministry raised the maximum state procurement prices for top grades to 2.53 pesos a liter of milk and 8.90 pesos a kilogram live weight of beef, from 1 July 2007, about two and a half times their previous levels, without increasing the controlled retail prices, which means additional state budget support for these products (Nuñez Betancourt, 2007). 7. The U.S. was the leading source of Cuban agricultural imports in 2006, accounting for 32% of the $1039 million recorded by Global Trade Atlas, followed by the European Union (16%), Brazil (14%), Argentina (7%), and Canada (6%) (United States International Trade Commission, 2007, pp. 2–4). 8. Contracts for potatoes, tobacco and pigs, which also include commitments on the part of the procurement enterprises involved to supply the farmers party to these contracts with resources required for production, are the exception to the rule that purchase contracts for farm products stipulate only the delivery obligations of the producers (Pagés and Castaño, 2006a). In the sugarcane sector, “the buying capacity provided by the sugar ministry (MINAZ) to access resources, in reality is not fulfilled because there are many difficulties with financing and entry of supplies,” Lugo Fonte, the president of ANAP, pointed out in an interview with Granma in early 2006 (Pagés, 2006a). 9. Indicative of the buyers’ low hierarchal status in the organization, they operated on foot in attending to large numbers of suppliers, according to the head of Acopio, who noted that their working conditions and wages needed to be bettered if the contracting process was to improve. 10. Acopio is not the sole food marketer. Some urban market gardens, credit and service cooperatives, agricultural production cooperatives, UBPCs, state farms and other entities also engage in food retailing. So-called agricultural markets of supply and demand, selling at uncontrolled prices, of which there were said to be just 73 in the entire country in early 2006, were run by the domestic commerce ministry. 11. Alongside the lack of containers, because of which much produce was lost, the failure to weigh the produce at the point of collection was one of the problems highlighted by Lugo Fonte who declared: “[The farmers] don’t understand it and in reality nobody can understand it” (Pagés, 2006a). 12. The issue continued to fester. Over a month later, in May 2007, ANAP’s Lugo Fonte told the press that whereas the agriculture and sugar ministries had caught up on their debts, social institutions were still late in paying for supplies (Pagés, 2007a). Since money has a time value, education and public health therefore continued to be financed in part by small farmers. According to minister of finance and prices Georgina Barreiro, the unsettled debts to cooperative and private farmers were reduced from 25 million pesos to 100,000 pesos between December 2006 and April 2007, and steps had been taken which, it was hoped, would prevent a recurrence (Lee, 2007b). 13. Not to be overlooked, however, are nuances, albeit only slight. While deputy agriculture minister Juan Pérez Lamas wanted ceiling prices extended to vegetable sellers not so far covered, ANAP’s Lugo Fonte thought supply and demand agricultural markets should stay, but be better controlled. 14. Some idea of the forgone output and waste associated with the system can be gained from the statements of a senior agriculture ministry official that milk deliveries could be increased up to 35% by greater efficiency in the process of reproduction and that the volume of milk gone sour decreased by 350,000 liters in January-May 2007, compared with the same period the year before (Pagés, 2007b). 16. Reviewing that “demarketization,” Ritter (1974, pp. 234–239) observed (at p. 237): “The elimination of some 3700 street vendors in urban areas . . . had the effect of destroying informal systems that gathered food inputs from many sources, combined the inputs, and sold them in locations of convenience to the buyers. Such street vendors of course had no written accounts, no statements outlining the sources and time of purchase of inputs, and no outlines of marketing activities. The state could not successfully have replaced this spontaneously operating system with the standard form of bureaucratic control even if it had tried because the costs of obtaining the relevant information as well as of planning and monitoring such a system would have been prohibitively high.” The rest is history: the state tried, failed, and so far has not been held to account for the costs. 17. One can almost feel sorry for the functionaries tasked with administratively compatibilizing production and consumption, supply and demand, rural and urban purchasing power, self-consumption and sale, input and output prices, agricultural raw material availability and industrial processing capacity, regional deficits and surpluses, etc, etc—all the while keeping in mind the political imperative of furthering the “alliance of workers and peasants”—as required by the theoretical frame of reference for state farm product purchasing enterprises adumbrated by Duyos (1964). Promised then and repeatedly thereafter, “radical changes aimed at doing away with centralization and bureaucracy” were to bring practice closer to the ideal. Fifteen months later, an anonymous note in the monthly journal Cuba Socialista warned of the “complexities” of regulating production and consumption (Notas económicas, 1965). And that was not the only difficulty—policymakers, it turned out, lacked the most basic statistical data to do so. As part of the explanation for the seemingly disproportionately large contribution of the private sector to the volume of agricultural products sold to state procurement agencies, a subsequent Cuba Socialista note drew attention to an analysis of the Institute of Physical Planning showing that the commonly assumed 70:30 division of land between the state and private sectors after the second agrarian reform in 1963 referred to the national territory and not to net agricultural land, more indicative of productive potential. In terms of the latter, the respective shares were 57% and 43%. Moreover, in terms of soil capacity, only an estimated 44% of the state agricultural land was classed of good productivity, whereas 87% of the private sector area fitted that description. Against this background, Notas económicas (1966) highlighted several studies which demonstrated that the application of uniform procurement prices across the country evoked very non-uniform responses because of regional differences in yields and production costs. The same studies revealed the dissatisfaction of small farmers with the availability and prices of different production inputs. Small wonder, then, that about a third of an article on tobacco growing by small farmers was devoted to the deficiencies in the supply and pricing of production inputs (Martín, 1967). 18. Mesa-Lago (2006) and Mesa-Lago and Pérez-López (2005) offer convenient entry points to the already considerable body of studies of various aspects of the Cuban economy in the Special Period and proposals for reform by Cuban and non-Cuban scholars. Alvarez (1999) describes recent Cuban precedents for the formation of independent agricultural cooperatives. 19. What seems singularly inappropriate, so long as lack of public and private personal transport makes it difficult for people to go farther than walking distance, is the continued inclination towards centralization and gigantism, as evidenced by the opening of a 1.2–hectare state agricultural supermarket in Pinar del Río, run by Acopio (Suárez Ramos, 2007), and ANAP head Lugo Fonte’s announcement of a “gigantic fair” with the participation of cooperatives from Pinar del Río to Ciego de Ávila (Pagés, 2007a). G. B. Hagelberg had an intimate view of Cuba’s sugar industry and economy as a journalist on the island from 1960 to 1968 and is the author of numerous publications, including a book-length study, The Caribbean Sugar Industries: Constraints and Opportunities (1974). From 1980 to 1986, he served as the resident sugar adviser of the government of Barbados and was decorated for his services with an Honorary Silver Crown of Merit in the Order of Barbados. More recently, he contributed to Reinventing the Cuban Sugar Agroindustry, edited by Jorge Pérez-López and José Alvarez (2005).